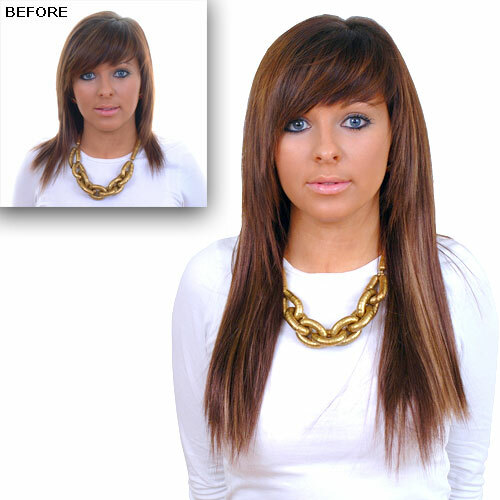 Synthetic Multi Layered once piece 100% human hair extension from the Luscious Locks range. These hair pieces are high quality that we use and fit in the salon for people wanting to achieve a completely different look. Change your look from short hair to long hair, straight to wavy, or wavy to straight. These pieces are especially popular with bridal parties. The extensions consist of one multi-level, contoured piece that creates an easy, fashionable style without the hassle of working with several individual wefts. Simply clip it in and you`re ready to go. Our hair pieces consist of 9 individual mini clips that provide a secure and reliable hold without any gaps. 100% human hair means that the hair piece can be treated like your own hair. You can style it by curling or straightening it. Our salon clients usually have the piece cut to a desired length or style in the salon once the piece is fitted. Pin the hair up on the crown. Sections the remaining hair into 3 sections and pin as tight as possible to the head. Tease the nape of the neck area and apply some hair spray. Do the same around the hairline as this helps the clips to sit more securely. Open all 9 clips on the hair piece. Apply the 2 nape clips first and snap closed. Then apply the 2 side clips stretching the hair piece over the scalp. Next stretch the hair piece over the scalp and secure the middle clip. The stretch the hair piece round the sides on the head and making sure the hair piece is even and there are no gaps and it is tight to the head. Finally, release the hair on the crown that was pinned up in stage 1.